Home > LUGGAGE > Spinner Luggage > Medium 24-27"
Medium spinner luggage is built lighter and better today than ever before. Pack enough for a week adventure. Outer zippered compartment includes mesh zippered pocket. Ideal for a 4-6 day trip. Removable organizer for smaller items and toiletries. Ideal for a 4-6 day trip. Zippered mesh pocket and large plastic dry pocket on lid for separating items. Ideal for a 4-6 day trip. 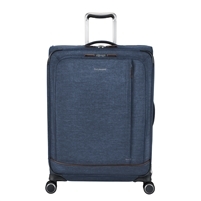 The Samsonite Centric 25 inch Spinner Luggage in Blue Slate is ideal for a 4-7 day trip. The Samsonite Centric 25 inch Spinner Luggage in Silver is ideal for a 4-7 day trip. The Samsonite Centric 25 inch Spinner Luggage in Teal is ideal for a 4-7 day trip. The Samsonite Centric 25 inch Spinner Luggage in Caribbean Blue is ideal for a 4-7 day trip. The Samsonite Centric 25 inch Spinner Luggage in Black is ideal for a 4-7 day trip. The Samsonite Centric 25 inch Spinner Luggage in Burnt Orange is ideal for a 4-7 day trip. Looking for a specific medium size spinner bag? Please don't hesitate to ask and we will find it for you!